The working group for the Sitka Food Hub project from the 2013 Sitka Health Summit will meet from 6-7:30 p.m. on Monday, Oct. 28, at Harrigan Centennial Hall. This is the second meeting of the group, which formed during the Sitka Health Summit in late September as one of the summit’s two community wellness projects for the upcoming year. While the group’s ultimate mission, vision and goals still are being refined, community members at the Sitka Health Summit said they wanted the Sitka Food Hub to serve multiple functions — to be a place to help feed Sitka’s hungry while also serving as an emergency food supply for the community and also to provide education about how people can build their own personal pantries. For this meeting we will be joined Lauren Havens, who has graciously offered to help facilitate the meeting. Topping our agenda will be hearing reports from volunteers who have been researching other food-based or food-related groups in the area , state and around the nation. The group will be discussing a few things, including some pertinent definitions and finally a heavy focus on refining our mission, vision and goals so we can move forward with this exciting project. We also may discuss a project name change to better match definitions used by major food policy groups. We hope we will see you there. To learn more about the Sitka Food Hub and to get onto the group’s email list, contact Marjorie Hennessy at 747-7509 (days) or marjorie@sitkawild.org. 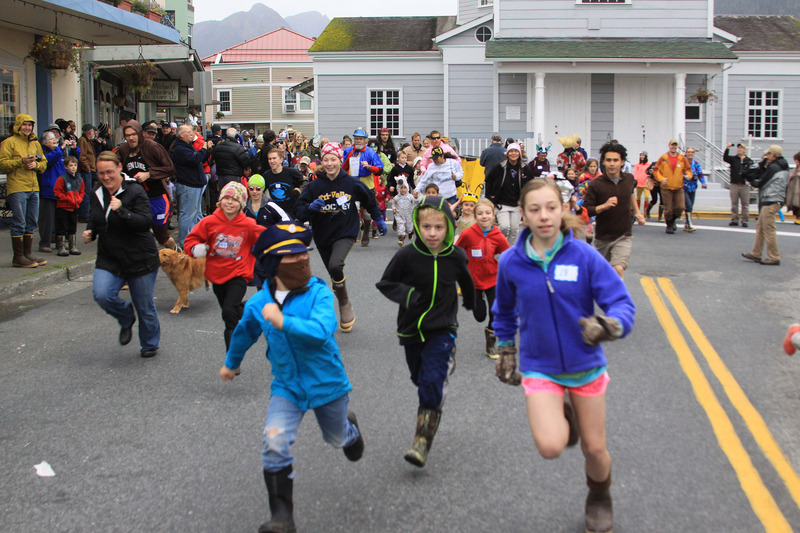 The 19th annual Running of the Boots costumed fun run fundraiser for the Sitka Local Foods Network took place on Saturday, Sept. 28, as part of the End-Of-Season Celebration. This year the race had a new course, starting in front of St. Michael the Archangel Russian Orthodox Cathedral and heading out Lincoln Street before looping onto Harbor Drive near City Hall and finishing on Maksoutov Street. There also were prizes for costumes, a table with late-season produce from the St. Peter’s Fellowship Farm communal garden, a band, and more. Did you vote today? 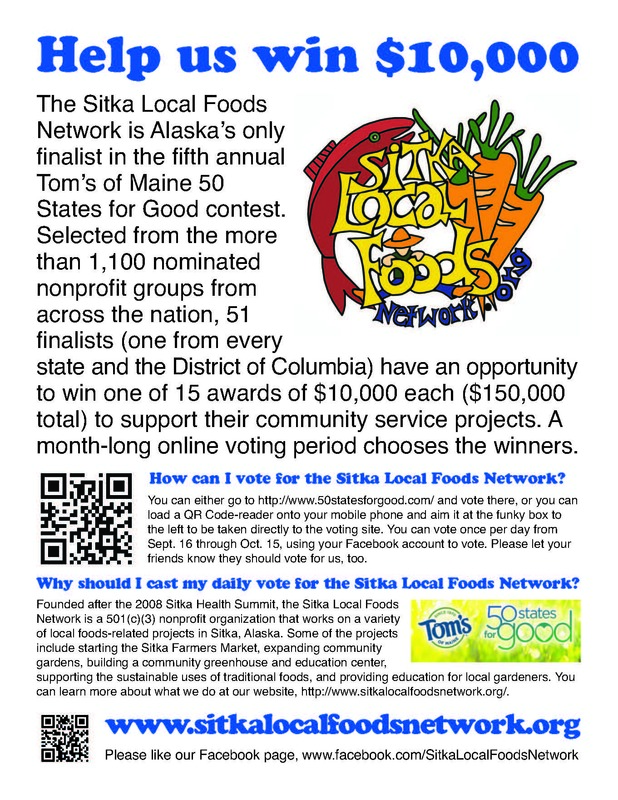 Please help the Sitka Local Foods Network win a $10,000 grant to continue its work on food security and local foods issues in Sitka, Alaska, by voting for us in the fifth annual Tom’s of Maine 50 States for Good contest. There is one finalist per state (we are Alaska’s representative), and the top 15 vote-getters each get $10,000 to continue their work. But we need to be in the top 15 to win anything. If we win, we will use the money to expand community gardens, improve the Sitka Farmers Market, and support other local foods projects right here in Sitka.